The LM393 consists of two independent voltage comparators. 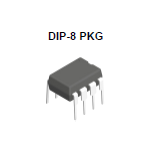 These were designed specifically to operate from a single power supply over a wide range of voltages. Operation from split power supplies is also possible and the low power supply current drain is independent of the magnitude of the power supply voltage. The outputs can be connected to other open-collector outputs to achieve wired-AND relationships.